Nail art is one of my favourite ways to get creative with make-up. 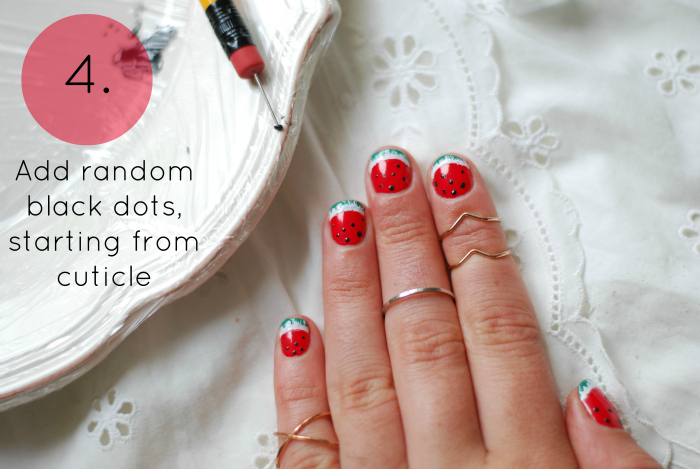 It is such a fun way to add a little something else to your look- wearing just jeans and a tee can feel 1000x more interesting with a little bit of sparkle on your nails. 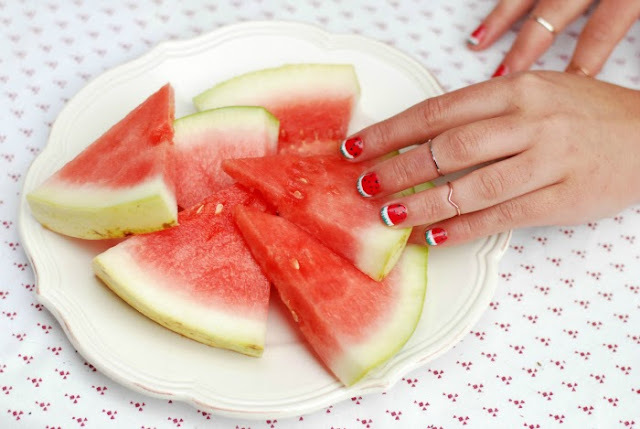 Plus, I can't resist a theme :) I love this watermelon manicure for being sweet and summery, it looks great on short or long nails and it really is easy as anything! 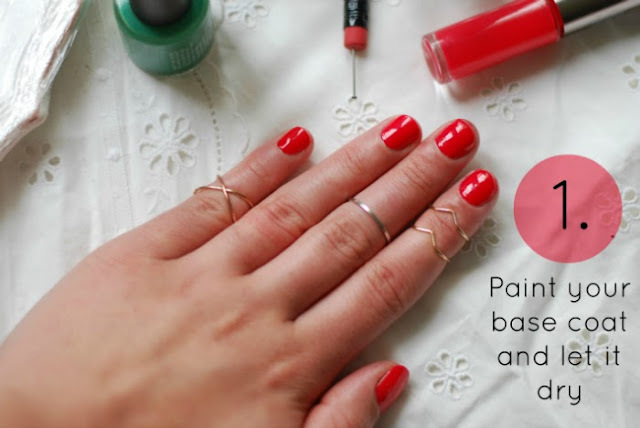 Before anything, file and shape your nails and pop on your base coat. Then you're ready to get started! 1. Paint your nails all over with your deep coral varnish and let it dry. Have a blog browse or pop on some telly. 2. 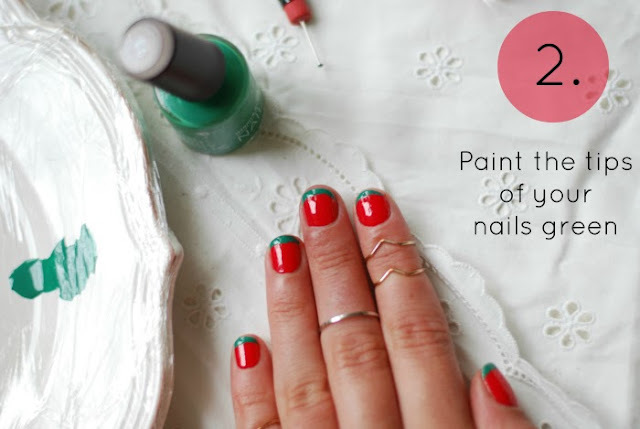 Freehand, paint your green varnish french tip style. Don't panic if your lines aren't completely straight, its fine! A quick tip is to dab off some of your extra varnish onto your palette so it doesn't blob and become too thick on the ends of your nails. Let it dry for a minute or two. 3. Dab a good blob of white varnish onto your palette and then dip your weeny nail brush into it. 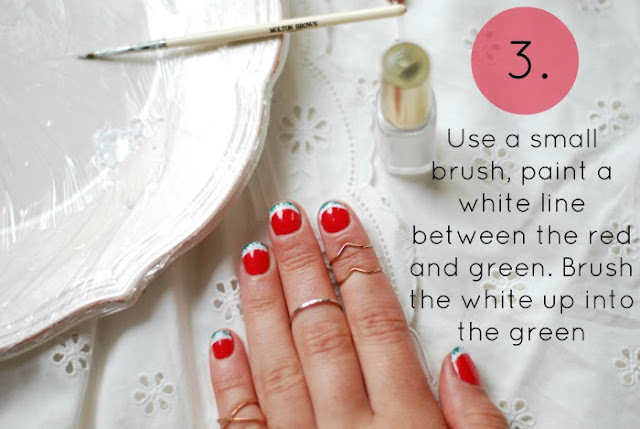 Paint the white varnish in a line just below the green varnish. Then drag up a little of the white polish is rough lines up into the green polish- it gives the duo effect of the rind nicely. I find it easiest to do each nail completely before moving onto the next so that the polish doesn't dry before you can drag it up. 4. Blob some black polish onto your palette, dip your dotter into it and dot away! Start by the cuticle and make the dots more sparse by the rind. Then you just need to paint on a top coat and you're done. I really hope you enjoyed this little tutorial! If you'd like to write a guest post nail tutoral on my blog I'd love it! 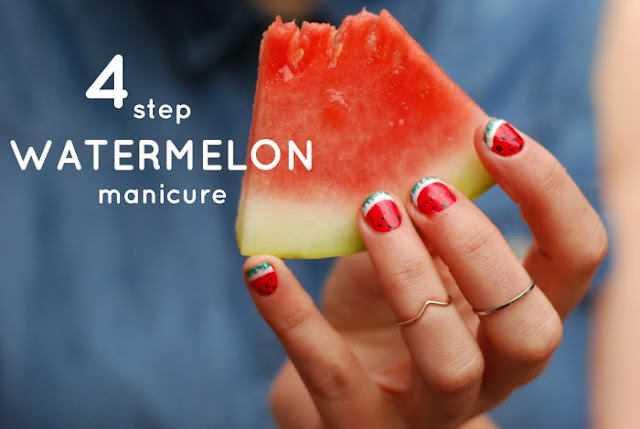 These are so cute, I tried doing strawberry nails once but they didn't look anywhere near as professional as your nails!